Ktwo Sales manufacture high quality farm machinery at their home in Buckinghamshire. They were established in 1988 and began making and selling drum mowers and swath conditioners across the UK. Now fully established as a leading UK manufacturer of muck spreaders and trailers this family run firm goes from strength to strength. 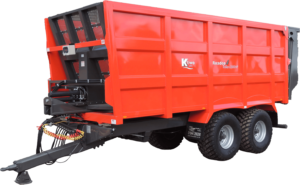 K Two offer a range of muck spreaders designed to perform and built to last. High quality materials combined with shot blasted steel covered with 130 microns of two-pack marine specification paint produce excellent build standards. The whole range has commercial axles and brakes fitted as standard which helps ensure these muck spreaders have a long working life.The Eco range has twin beaters and offers 5, 6 and 7.5 ton variants. This caters for tractors from 75 – 95hp and there are also several options you can add, including slurry door, wooden side extensions and wide angle PTO shafts. It’s big brother is the Duo which offers 7 spreaders from 6 – 14 ton. Of course this versatile machine can spread a variety of materials & will suit many farming and contracting needs. This range can be powered by tractors from 85 – 140hp Optional extras include weigh cell technology, electric in cab control, steel extnsions and hydraulic jack. The big daddy of Ktwo’s muck spreader range is the Evo. 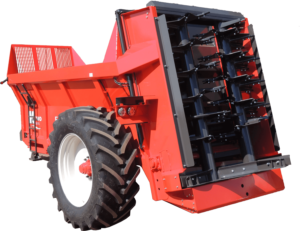 5 spreaders from 14 – 36 ton suitable for tractors up to 250hp. These muck spreaders certainly provide excellent accuracy and the highest outputs available across the material range. There a various options you can add including a sprung drawbar, swivel hitch, twin axle and auto application rate control. Ktwo offer an excellent range of agricultural trailers. Rodeo monocoque trailers are certainly engineered to the highest standards. 3D design modelling and structural analysis techniques ensure they are designed and manufactured to the highest of British manufacturing standards. The Rodeo Compact and Push trailers are the UK’s most popular ejector trailer. Particularly suitable for a variety of loose materials the 2500 model can transport up to 74.3 cubic metre capacity with compression. Each model has a sprung draw bar, 10 stud commercial axle, hydraulic tailgate and LED lighting as standard. However a range of optional equipment is available to tailor the trailer to your specific requirements. Available in capacities of 12–20 tonnes, the Curve tipping trailer is particularly suited to the demands of today’s farmers and contractors. The tried and tested tipping technology combined with high tensile steel constructions combines strength and reliability to give a long working life. As with all Ktwo’s spreaders and trailers, they offer very high specs as standard across the range. Of course you can add optional extra’s such as air brakes with load sensing, silage extensions and rear towing hitch. These twin ram trailers are available in body lengths from 5.5m to 7.7m. There are also dumper trailers, flatbed trailers and grassland aerators in Ktwo’s range. All manufactured to high standards and designed to offer great value and a long working life. Please visit our showroom at BRM or follow the link below to the Ktwo website for further information.